The city of Palenque was founded in the colonial period, near the archaeological site of the same name, but it was almost two hundred years later that the ancient Mayan city was discovered by a priest and it was then known that its original name was Bakal-Ham, that means “plenty of waters”, due to the abundant rivers of the area. Immersed in the jungle of Chiapas, Palenque is a sanctuary of the classical period with some of the best examples of architecture and reliefs by the Mayan people. Home of a powerful dynasty that reached its splendor between 500 and 700, the Archaeological Site of Palenque is a majestic place declared World Heritage by UNESCO in 1987. The Palace, the largest and most complex building of the archaeological site, features stairways, underground passages and patios. The Temples of the Cross group is formed by three buildings constructed atop step pyramids: the Temple of the Sun, the Temple of the Cross, and the Temple of the Foliated Cross. Discover the Temple of Inscriptions, a magnificent building sheltering the tomb of the legendary King Pakal, that is one of the longest and most important hieroglyphics in the Mayan civilization. 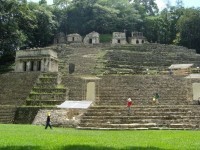 There are numerous attractions worth to visit near Palenque. The archaeological sites of Bonampak and Yaxchilan are southwest, while the Agua Azul Biosphere Reserve is located west. The waterfalls of Agua Azul are formed by the tributaries of some rivers, where there are shallow canyons and vertical cliffs with crystalline waters. Misol-Ha is another natural attraction near Palenque. This waterfall is in Ejido de San Miguel, 20 kilometers (12 mi) from the archaeological site of Palenque. A singular fact of this place is that it was used as a natural location for the movie Predator, starred by Arnold Schwarzenegger. In the city of Palenque you will find hotels, restaurants, bars, and the crafts market, where you can buy silver jewelry, colorful textile works, leather items and pottery.